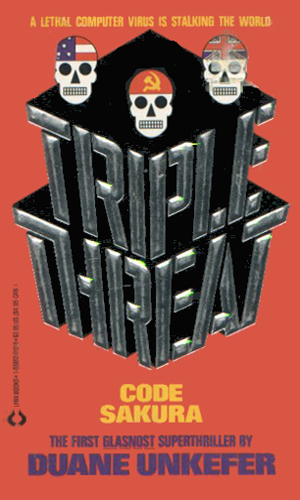 Triple Threat is a literary name for a team of three agents from different nations. This series was created by Byron Preiss Visual Publications as a serial in which each book would tell a distinct story but one that was part of an ongoing plot line. 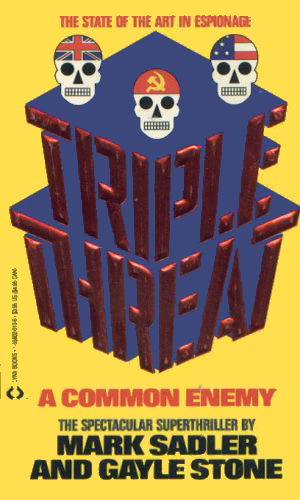 In this two-book case, the plot deals with viruses, one biological and one computer, both of which are threatening the welfare of the entire world. The three agents that make up the Triple Threat series come from the three best-known Intelligence organizations in the world, the CIA, MI-6, and the KGB. While usually the first two would be rival “cousins” against the third, in this series the men are not fighting each other but are each fighting a piece of the enemy putting them all at risk. From the CIA comes Jake Bolt, a man in his early 30s who has become one of the best field agents that department has ever had. He is in peak physical condition, anxious for action, loving danger, and ready to woo and bed any beautiful woman within reach. He is dashing, funny, smooth, and eminently respectful as he talks his way into their hearts and their boudoirs. He is just as fast and smooth when it comes to killing people trying to kill him. Hugh Willoughby is with MI-6 and is considerably older, being 57. He is far more experienced than Bolt and may have in his youth been the lover that Bolt is now but with the years has come a much greater maturity. He has been shot and beaten and nearly killed too often to take it lightly but though he cannot move as fast as he once did, his brain is every bit as good as it ever was and he uses it well. The third agent is Yuri Fyodorov, a man in between these others in years and experience. He is a firm believer in the Communist cause but after so many years abroad he can be honest enough with himself to know it is not perfect. Though he might wish for change from the inside, he would fight to the death to keep that change from being forced from the outside. The first book deals largely with Willoughby with Bolt coming in later in the adventure and Fyodorov playing a smaller role. The second books sees Fyodorov's role not that much bigger but Bolt is the star attraction and Willoughby is there helping out. While the British agent seeks the creator of a particularly nasty new drug, the American agent is after the murderer of a government computer programmer and the Soviet agent looks for the one behind a sequence of computer failures in key military systems. With the identity of the common enemy responsible for all the computer troubles occurring with rapidity among the major powers still unknown, Bolt, Willoughby, and Fyodorov know they have to work together. I really wanted to like this series. The first book was moderately okay, except for the very lame seduction scenes, and the second one clearly showed that quality writers were at work. But the teamwork between the three agents just didn't mesh and that was vital to the success of the series. I got the feeling that none of the authors had ownership of the project. I could be dead wrong but that is how it comes out. The characters have no life to them, the plots are staid, the action perfunctory, and the whole feeling is one of “I was hired to write so I write. No one said anything about it being good.” Perhaps unfair of me but that is how it feels.